Wild salmon from British Columbia, has earned an international reputation as a premium quality, highly nutritious protein source. Harvested for centuries along the west coast of Canada, first by Aboriginals then by early settlers, BC salmon has become an integral part of BC’s environment, culture, identity and economy. Today it is a $400 million business. Salmon farming and fishing employ thousands and provides sustenance for hundreds of communities along the west coast of Canada. Wild Pacific Salmon is an ancient fish. It is possible to trace the ancestry of this fish back six million years when it had fangs, weighed over 500 lbs. and was ten feet long! The salmon’s ability to move between fresh and salt water has enabled it to evolve through at least five major ice ages. Birth: Spawning females scoop out a hollow in the gravel of a streambed and lay 2,500 to 3,000 eggs. Eggs are immediately fertilized by the male then covered with gravel by the female to incubate eggs over the winter. Alevins are first hatched from the eggs while still under the gravel. Alevins grow into fry at which point they resemble miniature salmon. Fry develop into smolts which then migrate to the ocean where they grow into adults. Death: When adult salmon are ready to spawn, they miraculously return to the very river or stream of their birth. During the last leg of their journey home, they cease feeding and live off their stored fat. Their bodies change colour and shape during this time, and once their eggs are laid and fertilized, their cycle is complete and the salmon die. Instead of river reproduction farmed salmon spend their first 12 to 18 months in a land-based recirculating aquaculture system (RAS) facility where they hatch to alevin, develop into fry, and finally go through the smolt transformation. Once smolts reach about 100g they are vaccinated against common ocean viruses and transported to the ocean farm located in the most remote areas of the B.C coast. Often farmers live in floating houses on the farm to monitor the fish day and night. The fish live here for up to two years where they are fed a nutritious feed in the form of dried pellets, (similar to dry dog food) until they are approximately 10 to 12lb when they are transported by boat to the processing plant. Sockeye: Average lifecycle 5 years. Average weight 6 lbs. Sockeye spawn in streams with lakes in their watershed and stay in those lakes for one to three years before migrating to sea. They travel thousands of miles into the Gulf of Alaska and North Pacific Ocean where they feed. They return to their spawning stream when they are three to six years old. Because of its long migration, sockeye carry a considerable amount of fat, making it an important source of omega-3 fatty acids, which gives the meat a rich and intricate flavour. Coho: Average lifecycle 3 years. Average weight 4 to 12 lbs. Young coho fry are different than the other salmon species as they stay in their spawning stream for a full year after they emerge from the gravel. Adult coho usually return to fresh streams close to the ocean, although some will journey as far as 1,500 kilometres inland. Coho are similar in taste and texture to sockeye salmon with a moderately full flavour and medium texture. The reddish-orange colour of the flesh is retained after cooking. Chinook: Average lifecycle 4 to 7 years. Average weight 20lbs. Chinook fry may go to sea soon after hatching, or after one to two years in fresh water. Chinook migrate as far as 1,500 kilometres inland. Chinook are generally considered the richest and most flavourful of all salmon. Pink: Average lifecycle 2 years. Average weight 4lbs. Pink salmon fry migrate to the sea as soon as they emerge from the gravel and live almost their entire two years in the ocean. Adults leave the ocean to spawn in streams that are a short distance from the sea. Pinks are lean and mild in flavour with low oil content and a small flake. Chum: Average lifecycle 3 to 5 years. Average weight 8lbs. Chum salmon generally spawn in late fall and usually in the lower tributaries along the coast, rarely more than 150 kilometres inland. Fry emerge in the spring and go directly to sea. Because of their low oil content, chums are considered one of the milder species of Pacific salmon. The numbers of wild salmon that return to BC waters to spawn varies greatly from year to year and even decade to decade. For example, many sockeye salmon populations are very abundant every third or fourth year. Warming ocean waters and reduced water levels in rivers have a long-term impact on BC Salmon. Warm water causes a decrease in the food salmon eats which results in a lower survival rate and hence lower numbers of spawning fish for future stocks. BC exports wild salmon to 53 different countries generating an average export value of $100 million. The United States, Japan and United Kingdom are our highest value export partners. Canadians consume another $50 million worth of wild salmon products. Farmed salmon is double to triple farm gate sales and provides 6000 jobs to British Columbians. Farmed salmon is the province’s largest export product. Salmon is an excellent source of tryptophan, an all-natural sedative. Salmon is an excellent source of vitamin D. One can of salmon contains a day’s worth of vitamin D.
Salmon protects your eyes. 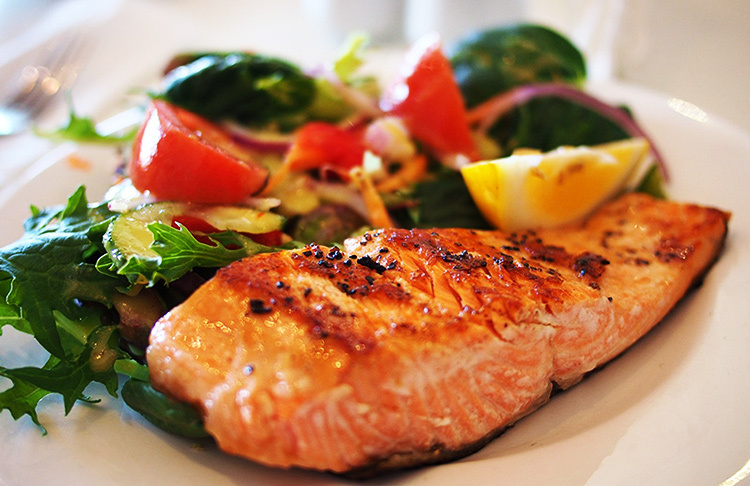 Eating salmon twice a week has been shown to significantly decrease the risk of macular degeneration. Eating salmon increases your cardiovascular health due to its high levels of the omega-3 fats, EPA and DHA which reduce inflammation, keep the blood from clotting excessively and relax dilating arteries. Eating salmon is beneficial in the treatment of osteoarthritis and other inflammatory joint conditions. Salmon colour is the result of pigmentation by carotenoids, found in algae eaten by the food salmon eats. Count the rings on a fish scale to determine their age…much like counting the rings on a tree. The skin colour of sockeye and chum salmon changes from black to grey to brown to red as it approaches fresh water in the spawning season. Atlantic salmon can spawn more than once, but some die of exhaustion after breeding. Pacific salmon reproduce only once and die shortly after.